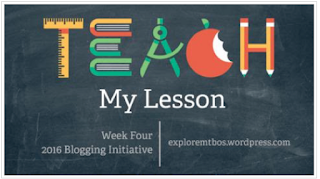 This is my 4th entry in the #MTBoS Blogging Initiative. I have completed all 4! This lesson was for my Accelerated Algebra 1, all freshmen class. We have been on this unit since before Christmas Break and need to finish it up this coming week so we wrap it up before February break. It has been very choppy, but we have worked on Polynomials - vocab, classify, add, subtract, multiply, long divide, synthetic divide, factoring all types, and now graphing. We teach Polynomials before our Quadratic unit, so they have not seen any of these crazy graphs. Before I start, I wanted to add that the more I teach, the less I think that teaching is about the teacher giving knowledge to the student and more about providing opportunities for the students to learn for themselves. Every day I try to create these opportunities in our math class. This was a good sequence of lessons for that to happen. Prior lesson: Day 1 of graphing factored form polynomials is a calculator lab. Yes, I love Desmos and we will use that, but I still see the benefit of working with the calculator and pencil and paper and going through each step, changing one thing at a time, so they can notice what is happening and why (hopefully). The students worked on the lab and finished it for homework. I would say about 50% understood what I was looking for in parts during that class. There were a lot of Aha moments that I love. I had to point out some of the connections to some of the groups. Calculator Lab. Day 2 - Graphing - The lesson I am going to elaborate on. I had two main parts to the lesson - a worksheet that had them practicing going from equation to graph and vice versa and the Desmos polygraph lab to play against each other using questions and appropriate vocabulary to guess the other's chosen polynomial. 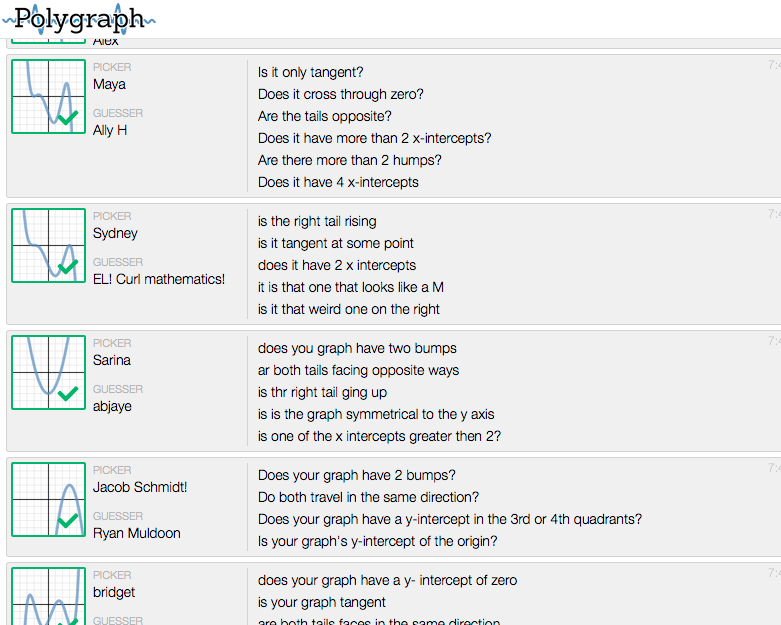 I was going back and forth with which to start with and ended up deciding on the Desmos polygraph. They have to work in partners, even though those partners change, but I didn't want them to work on the worksheet first, finish at different times, join Desmos and sit and wait. So, Polygraph first it was. This is a new term for us, so I had some students who were new to me. My old students have played Polygraph, but the others have not. It was fun to show them for the first time. 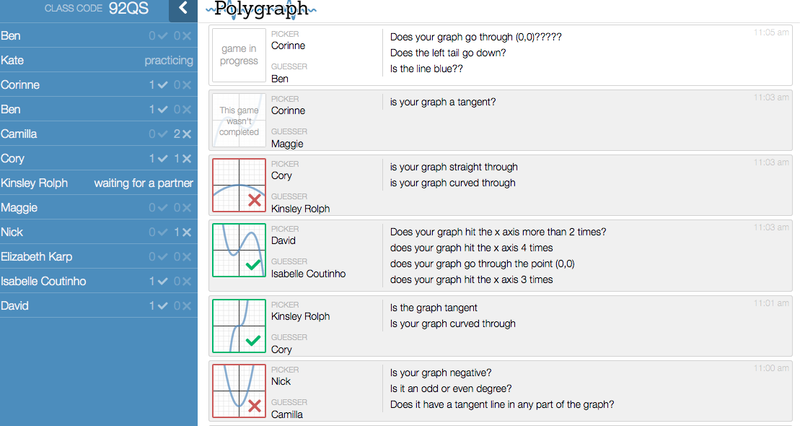 Teachers - go to www.teachers.desmos.com and search polygraph - you can find one for any type of graphing. 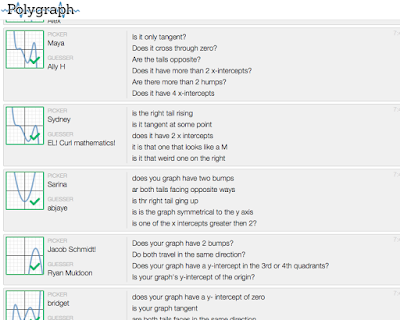 You create a class, get a code, ask the students to go to www.student.desmos.com and off they go. They get to play the child game of Guess Who with people's faces against the computer to see how it works - how to ask yes or no questions - that, in itself, is challenging. And, then Desmos automatically pairs them up. One person chooses a graph and the other answers yes or no questions about it as they try to guess which one. Once they finish, Desmos will automatically match them up with a new player. "You can't ask if it is in the top row. That is cheating." To which I noted that Desmos changes them up on each of your screen so that wont' work anyways. "How many bumps?" Ah, not a yes or no question but there were lots of bump questions. I am not focusing on the max and mins just the end behaviors, the x-intercepts and what happens to the shape at the x-axis. In Alg 2, we will address the min and max and increasing, decreasing, etc. "Is your y-intercept in the 3rd or 4th quadrant?" Hmmmm, I couldn't quite understand what this student meant, so I went over to him. I was talking about the line in between the 3rd and 4th quadrant, so I asked if he could think of a different way to ask it. He pointed to the graph and thought about it and then said, "Oh, is the y-intercept negative?" Ah, that is better. I let them play for 20 minutes. That was a good amount of time to not lose the excitement. They got in between 5-7 games each. Here they are working. I happened to catch a student flipping her hair in the picture. Onto this worksheet. First, I gave them the equation, asked them some questions - is it positive or negative, odd or even, what are the x-intercepts, what happens at the x-axis, and describe the end behavior, then put it all together for the graph - no calculator and no desmos - gasp! But, they were getting it. Productive struggle is a good thing! It makes it theirs! By the time they flipped to the back after those 6 problems, going from the graph to the factored form equation was easy. They had put it all together. Homework was another similar sheet to provide practice at home. This lesson was taught to period 2 on Thursday. Period 7 was supposed to be taught it on Friday (yesterday), but we got a snow storm and a snow day. I really needed to keep them on target to wrap things up this week before vacation, so I sent them an email in the morning and asked them to go onto Desmos at 11 am. Can't hurt to ask, right? I gave them the code and crossed my fingers. I did a bunch of stuff around the house hoping they might get the email and sign on. I checked my computer and Desmos still said "not run yet". Hmmm, it was 11:04. I sent them an email. Duhhhhh.....I needed to refresh my Desmos page and voila...they were all there, well, almost all there. I had all these students playing Polygraph on their snow day! Asking the same great questions as my period 2 class that was in front of me. It was great. I passed along the classwork sheet and the homework sheet as well. And, just like that we are still on track to wrap up Polys by February break. Thanks Desmos! Some good stuff. Thanks for reading. It is a testament to the power of Desmos that most of your students were willing to sign in on their snow day to do polygraph work. I have had similar success with these activities. And also a testament to you that you have nurtured a such a positive culture that students made time for this when no one would have been the wiser if they claimed that they hadn't gotten your note until after 11. Nice work, and thanks for sharing this reflection. It's hard not to get dismayed when I see that you're doing stuff in algebra 1 that my kids in algebra 2 aren't even doing. Though your class is already "accelerated." I just always feel like my kids are behind, though. I do work with kids who have had really spotty educational backgrounds... Hospitalizations, school refusal, etc. So they have a lot of knowledge gaps. But it still just feels awful to think that my class is far below where they should be and that I'm not doing enough to fix it. Anyway, I love this version of Guess Who! That's awesome. I'm thinking that could work in so many ways in all 3 of my classes... Like in my algebra 2 class, they could do that for quadratics. Opening up, opening down, location of y-intercept, location(s) of x-intercept(s), wide, narrow. We wouldn't even need cubics or higher polynomials to make it work well, I'm thinking! Thanks for sharing.